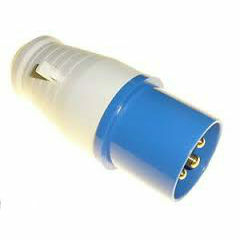 Workshop plug for 240V supply. The power transfer is far better than a square pin plug and of course is much safer. Splash proof to IP44, comes complete with integral cord grips and sealed entry point. Suitable for the Charnwood W691, W692, W792 & W792, F50-843 Dust Extractors. Andy any other machinery requiring a 16AMp supply.